This is the final selection by Computron 1.0. It was a FileMaker database, that somehow went missing. I don’t know where the file ended up. As I unpacked from my move, I recreated Computron as a Google Sheet. The next entry will be generated from that. 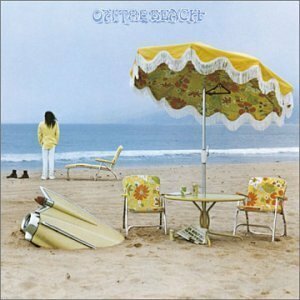 I haven’t been able to put down On The Beach, it’s one of Neil Young’s best records. I’ve had this record on loop since I finished writing the Another Side edition of Recollection. Contributions from Ben Keith, Graham Nash, David Crosby, Levon Helm, Rick Danko and many more make this one an all-star lineup for a bit of a strange record. Neil Young is no stranger to strange, and this won’t be his furthest departure, but this, his fifth record, is the beginning, or perhaps the end of the classic Neil Young. Depends on your perspective. He had his self-titled record under his belt, Everybody Knows This Is Nowhere (his first with Crazy Horse), and the brilliant After The Gold Rush and Harvest. Young would spend the rest of the decade creating with a quality of valleys and peaks. However, On The Beach is as much a child of Harvest as it’s the parent of Tonight’s The Night. This record is unique in its own right. But is it good? Hell yes. The opening two tracks, “Walk On” and “See The Sky ABout To Rain” are amongst the best of Young’s output. I would put those on any best of compiled for Young’s career. When the original line up of The Byrds reunited they took the spots usually reserved for Dylan covers and provided them to Young and Joni Mitchell. They performed “Cowgirl In The Sand” and “See The Sky About To Rain.” While the former isn’t much to write home about, Gene Clark’s vocals on “See The Sky About To Rain” are divine. It doesn’t compare to the Neil Young original, which in turn doesn’t compare to the version on his Massey Hall album. It’s hard to pick a lowlight, as the record is solid. There’s nothing I would remove, but I think “Vampire Blues” would be my least favourite.